The Ethiopian Border Affairs Committee (EBAC) was established in response to secret border negotiations between the Ethiopian government led by the late Prime Minister Meles Zenawi and the government of the Sudan that we believe would materially affect our Motherland’s territorial integrity, national independence and sovereignty and the interests of millions of Ethiopians for generations to come. In this regard, EBAC has conducted background research, mobilized tens of civic and political organizations, raised public awareness, provided press releases, transmitted official letters to the Secretary General of the United Nations, the Chairperson of the African Union, permanent members of the UN Security Council, members of the European Union, members of the Arab League, governments of Ethiopia and the Sudan and also the different governments of Europe, Asia, Africa and Latin America, defended Ethiopia’s legitimate rights and exposed the deceitful and traitorous nature of the secret dealings orchestrated solely by the Tigray People’s Liberation Front (TPLF). This minority ethnic group exercises singular sway within the Ethiopian Peoples’ Revolutionary Democratic Front that is now led by Prime Minister Hailemariam Dessalegn. 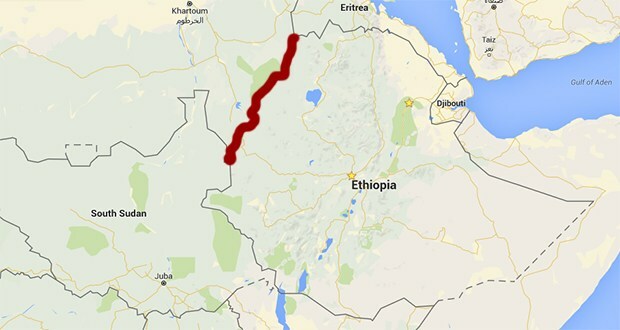 EBAC believes that Ethiopia’s borders are a consequence of enormous sacrifices in lives and material spanning hundreds of years. Successive Ethiopian governments led by Emperors Tewodros, Yohannes, Menelik and Haile Selassie and even the Socialist Military Dictatorship led by former President Mengistu Haile Mariam all had one thing in common. They defended Ethiopia’s territorial integrity and its borders with the Sudan. On November 23, 2015, Sudan’s Ambassador to Ethiopia, Osman Nafi “accused the Amhara regional government for recent skirmishes that” purportedly claimed the “lives of 25 Sudanese nationals.” He noted rightly that “This is an old problem not born yesterday. It was a matter of discussion between the two countries since the 1960s.” In fact, the problem emanated much earlier when Sudan was a British colony while Ethiopia was the only independent country in Africa. In EBAC’s seminal letter cosponsored by 25 Ethiopian civic and political organizations to his Excellency Mr. Ban Ki-Moon, Secretary General of the United Nations and the Chairperson of the African Union on January 10, 2014, we highlighted the legal underpinning of the border to which successive Ethiopian governments have adhered without compromising an inch of Ethiopian territory. None of Ethiopia’s previous governments recognized the boundary and border drawn by the British in the early 19th century. As we stated in our letter then and state again, The respective territorial limits of both countries were defined by the Anglo-Ethiopian Treaty of 1902 at the turn of the last century when Great Britain was the colonial power administering the Sudan. As is customary in international practice in delimiting national boundaries, the treaty provided for the setting up of a Joint Boundary Commission to be appointed by both sides to carry out the actual demarcation of the boundary on the ground. Upon completion of the demarcation process both parties were required to notify their citizens of the boundary as demarcated. We have insisted and continue to insist that this should occur before any binding agreement is concluded. Otherwise, it won’t be binding on Ethiopia and Ethiopians. Despite the clear mandate of these undertakings, however, the treaty has remained a dead letter for over a century and, as a consequence, the boundary between the two countries has never been demarcated by a joint commission. Instead, contrary to both the spirit and letter of the provisions of the treaty, Great Britain appointed its own officer, Major Charles W. Gwynn, to unilaterally and arbitrarily demarcate the boundary without the knowledge and the participation of Ethiopian boundary commissioners. Ethiopians should know that the demarcation line which resulted from this high-handed exercise greatly favored the Sudan while causing Ethiopia to suffer a corresponding amount of territorial loss. It is this highhanded and arbitrary action that the TPLF led government wants to legitimize in the coming few weeks. Notwithstanding the fact that the demarcation of the boundary by one of the Contracting Parties cannot legally bind the other, nevertheless Sudan has over the years importuned successive Ethiopian administrations to accept the validity of the unilateral demarcation undertaken by the British. Before the current government took power in Ethiopia in 1991, the consistent and unequivocal response of Ethiopian administrations has been to reject the validity of Sudan’s claims, calling instead for a negotiated settlement of the boundary on the basis of the original treaty with the full knowledge, participation and consent of peoples likely to be affected by the demarcation line. The TPLF has a treasonous track record of diminishing Ethiopia; it sponsored and facilitated the secession of Eritrea. EBAC states unequivocally that no Ethiopian regime in power has the right to cede Ethiopian territory without open discussion with the people of Ethiopia and without Parliamentary deliberations. EBAC is not aware of any government anywhere in the world that willingly, deliberately and treacherously cedes its country’s territory for which millions of lives have been lost and whose impact will be felt for generations to come. We urge all Ethiopians to reject this sinister act. Gravely concerned about the imminent danger we foresaw coming, EBAC stated in its letter to H. E. Secretary General Ban Ki-Moon that the international political system grants a considerable degree of importance to rights in respect of territory. These rights are inviolable regardless of who wields power in either country. Territorial rights are principles that affect sovereignty. They have nothing to do with increase in population as the Sudanese Ambassador to Ethiopia claims. The function of a boundary between states is the attribution of territory and, thus, the extent of a state’s territorial integrity and sovereignty. When the extent and limits of a state’s territorial sovereignty are determined solely and arbitrarily by one state to the detriment of the other, however, the boundary so determined becomes an enduring source of friction, tension and war between the adjoining states. The Sudanese Ambassador is right that Ethiopians and Sudanese share a common history of peaceful coexistence. The TPLF dominated government is doing the opposite of what is in Ethiopia’s interest. It has no right to abrogate this enduring relationship for short-term political expediency. International law is intended to anticipate and to avoid current and future conflicts. The principle that governs an international boundary is not arbitrary or capricious. Instead it provides a compelling degree of continuity and finality. This venerable principle will be respected and observed in practice by citizens concerned only if the given boundary was established in accordance with law rather than political expediency. The TPLF led regime which seized power unlawfully does not have legitimacy or legal credentials to cede Ethiopian territory and to create conditions that would trigger perpetual war in this highly volatile region. In order to avert future conflict and war, both the Sudanese and Ethiopian regimes have an obligation to abide by the Anglo-Ethiopian Treaty of 1902 and an appropriate Boundary Commission that will carry out the demarcation process. No other secret arrangement that will affect Ethiopia’s 100 million people adversely will be acceptable to us. Ethiopians at home and abroad were stunned to hear that, following the Sudanese Ambassador’s protest concerning so called Ethiopian incursions into Sudanese territory; Prime Minister Hailemariam announced that his government is ready and willing to demarcate the border within the next few weeks. If this announcement takes legal effect, the TPLF dominated regime of Prime Minister Hailemariam will cede huge swathes of our ancestral lands to the Sudan; despite the fact that Sudanese authorities are not even asking for such a transaction. This is the reason why we call it treason. It is unprecedented in the annals of Ethiopia’s long history. It must be rejected by all Ethiopians at home and abroad. Members of the EPRDF and Ethiopia’s Defense Forces must reject the deal. It is their responsibility to defend Ethiopia’s territorial integrity, sovereignty and national honor. No party or defense force with honor and dignity trades its own territory for money or political power and stay. EBAC wishes to remind the global community that Ethiopians received this announcement with utter shock, resentment and anger. Neither the current generation of Ethiopians nor those of future generations will allow the deal to stand. It won’t be binding. In fact, such action constitutes a serious violation of the treaty regime set up at the turn of the century and holds for naught the sacrifices of past generations of Ethiopians to preserve the territorial integrity of their country. We repeat our relentless pleas that hundreds of thousands of our people will be forced to lose their homes, farms and investments if the border deal is implemented without the participation and consent of the Ethiopian people. EBAC believes that the lead responsibility to defend and preserve Ethiopia’s territorial integrity and sovereignty reside in the Ethiopian people. We have full confidence that they will hence reject this underhanded scheme by a manipulative and cunning regime. EBAC is not unmindful that members of the United Nations and the African Union and their sitting governments like those of the Sudan and Ethiopia are clothed with a certain degree of legitimacy in the eyes of international law and politics, even as such legitimacy deprives ordinary citizens adversely affected by the decisions of those who rule them legal standing and recourse in such matters. And yet the actions of these officials who purport to speak in their behalf are bereft of any legitimacy in the eyes of the very populace whose interests they claim to represent. This is particularly true when it concerns highly sensitive and emotionally charged questions of territorial sovereignty. EBAC states unequivocally that the border deal of today hatched by unelected elites in Ethiopia will be the ticking bomb of tomorrow. Since the TPLF/EPRDF has neither support in law nor received the consent of the Ethiopian people, it will fester as a major source of friction and tension between the brotherly peoples of Ethiopia and the Sudan. The Horn of Africa region does not need an additional source of insecurity and instability beyond those that already plague the region. Accordingly, EBAC wishes to urge Ethiopians everywhere to make their voices heard. 1. We urge Ethiopia’s Defense Forces to defend the territorial integrity, sovereignty and independence of their country and to stand by the side of the Ethiopian people. We urge all Ethiopians to send emails and faxes to Secretary General Ban Ki-Moon, the Chairperson of the African Union at Chairperson@Africa-Union.org to the Sudanese Ambassador to the U.S., fax number 202-667-2406, and to Ethiopian political, civic and faith groups across the globe. We call on all Ethiopian media outlets to give prominence to this unfortunate development of betrayal. We urge Ethiopian academics and commentators to raise awareness concerning the dire consequences of the demarcation that will take place without public debate and Parliamentary approval. We call on all Ethiopians to hold public demonstrations to forestall the scheme. We call on Ethiopia’s Parliament to hold a hearing at the earliest possible time. EBAC goes on record asserting our right to territorial sovereignty as defined by the 1902 treaty – and not by any other agreement that is reached behind the back of the Ethiopian people. We go on record that we will not honor any boundary that results from the agreement of an unelected government that is devoid of any support or legitimacy among its own people. Finally, EBAC should like to go on record that the current extremely narrowly- based regime of Ethiopia and the similarly discredited government of the Sudan are grasping at straws by using the border deal as a way of ensuring their political survival by a mutual exchange of promises foreswearing the use of their territories by organized movements seeking to overthrow their respective governments. This survival instinct underlies the parties’ desire to make a border deal and to keep it from public scrutiny without consideration of its impact on the people of Ethiopia. We say to the Ethiopian people that this heinous act should not be carried-out at their expense. Ethiopia’s Sovereignty and Territorial Integrity will be defended by her finest sons and daughters!